Caramelized onions are a wonderful thing to give a boost of flavor to savory dishes, but the downside is that they can be a huge pain in the behind to make. When I’ve made them in the past, it’s been by standing at a stove stirring them for at least 45 minutes. 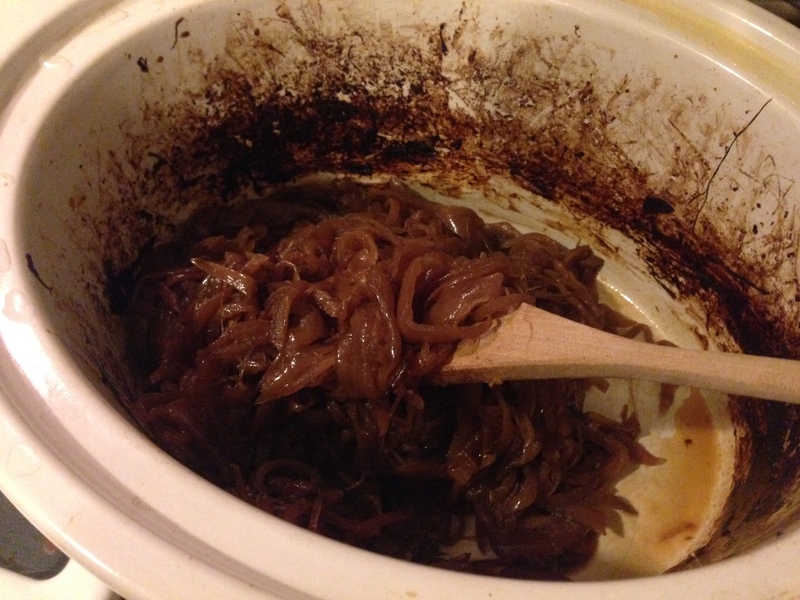 But, behold, today I learned that you can caramelize onions in a crock pot! This won’t be fast, but it’s super easy and you don’t have to stand there over them the whole time. You’ll still get your flavor and you’re freed from the stove. Win-win. How many onions you use will depend on the size of your crock pot. After slicing, I fit 4 large onions in mine, but you should use as many as it takes to fill your crock pot to the top without over-stuffing it. Don’t be alarmed at the quantity, as it will reduce drastically in volume as the onions cook. Slice your onions in half lengthwise, lay them flat side down, and slice them thinly. If you leave the root section intact while slicing, it helps to hold everything together. Then remove the root and put the sliced onions into the crockpot. Drizzle the olive oil over the onions. Turn the crock pot to high, lid it, and let it cook for 10 hours, stirring things up every few hours. I can’t guarantee what will happen if you leave the onions all day without stirring them, as some of the onion that was in contact with the sides browned much faster than the center portion. I recommend making these on a day that you can be home to mix things up a few times. They’re done when they’re a deep brown. After caramelization, you can freeze any unused portion to use later. Salads: green, pasta, grain, vegetable, potato, etc. Any type but jello. Sandwiches: grilled cheese, hamburgers, deli, etc. Meat: Over steak or pork chops, in stuffed chicken breast, etc. Omelettes and other egg dishes: quiches, fritattas, etc.